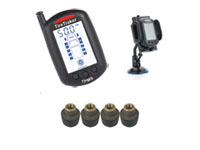 The TireTraker™ TPMS product line features the most innovative systems on the market today. Reliable, durable, accurate, attractive and easy to install - TireTraker™ has taken tire pressure monitoring systems to a new level of simplicity and sophistication, and most important - Affordability. Extensive customer research has aided us in bringing you the TireTraker™ Tire Pressure Monitoring Systems for use on RVs, trucks, trailers, fifth wheels, towed vehicles and buses. The TireTraker™ TPMS alerts the driver with both an audible and a visual alert of 3 different stages of low tire pressure, high pressure, high temperature and rapid leak situations in up to 22 wheel positions. The TireTraker™ TPMS are engineered to be both simple to operate and to install. No special tools are required. In fact, it is as easy as simply programming the monitors, and screwing on the sensors to the valve stems. And the sensors have replaceable batteries, saving you a great deal in future costs over other TPMS systems. 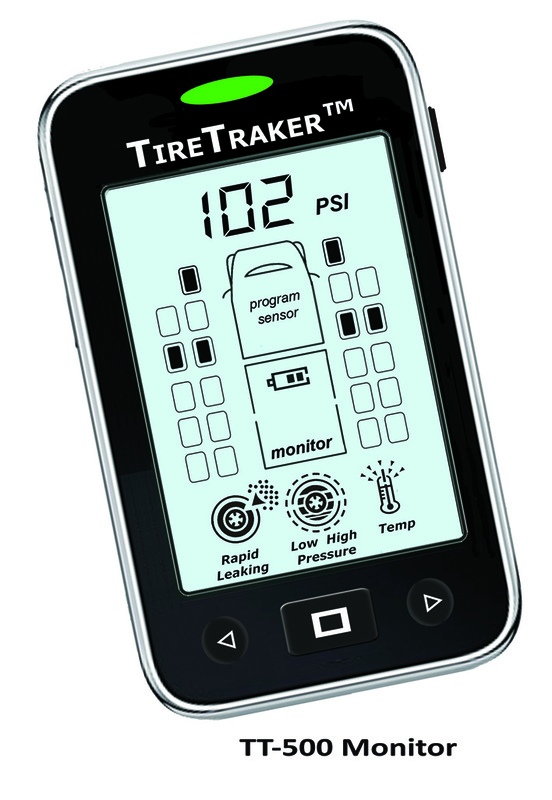 With the TireTraker™, the sensors are continuously reading, analyzing and communicating signals to the monitors about the air pressure and air temperature in each tire. With each signal, the pressure and temperature reading is transmitted to the monitor located near the driver. This wireless signal will read up to 65 feet for most truck and RV systems under most conditions. The systems are designed to do all of this without the use of any additional external antennas! The monitoring system display receives this signal and instantly compares the current tire pressure reading with the programmed baseline pressure level. When the TireTraker™ tire pressure sensor sends a signal to the monitors detecting a difference in tire pressure from the baseline pressure, or an increase in tire temperature above 167° F, both a visual and an audible signal are transmitted. With a flashing tire position light, an audible beep, as well as the flashing tire pressure and temperature icons, the operator knows which tire is in need of attention. The TireTraker™ monitors also includes a 'Rapid Leak' alert to notify you if a tire is losing air very quickly. In addition, we have even incorporated a high pressure alert to warn you in situations where the pressure in your tires has increased by more than 25% above the baseline pressure. If you have a metal skinned coach/trailer or have a longer application, a TireTraker™ TPMS Signal Booster may be needed to prevent signal loss. For these types of applications, we have Model TT100A available. It is a hard wired kit, designed to be connected to 12 volt power. The TireTraker™ TPMS have been designed with the interests of the consumers at heart. Our systems offer more features than competitive systems, and come with an affordable price. The systems have been designed to handle the extreme conditions of the road and changing weather conditions from coast-to-coast. Reliability of the communication signal is the key to all systems. A strong signal and sensitivity to the communication requires a unique engineering design to capture the signal under all types of conditions, including outside electronic interference, weather, and other vehicles. As with cell phones, signal interference is always a possibility, but the systems have been designed to ensure greater reliability at all times and under most conditions.